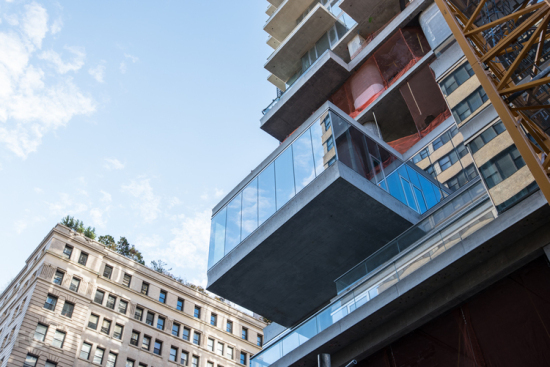 What's it like to live on a 700-foot-high cantilever that looks out over Manhattan? 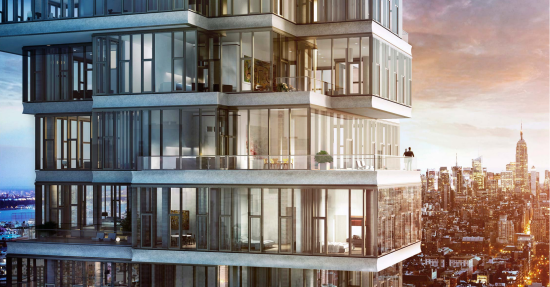 Herzog and de Meuron's Tribeca tower, 56 Leonard, does just that and images of its luxurious interiors have been revealed. Jacques Herzog and Pierre de Meuron, both from Switzerland, saw their structure realized in 2015 and the residential high-rise has quickly become an icon in the city due to the myriad of rectangular volumes that cantilever up into the sky. The 60-story, 145 unit building offers a plethora of amenities which can all be found on the ninth and tenth floors. Two levels comprise mostly concrete inside and cover 17,000 square feet, including a swimming pool and an elegant spiral staircase made of concrete of which is shown off in a double-height space. In a similar fashion and making use of the same material, cylindrical columns bridge more double-height spaces, drawing your attention to looped LEDs that hang from the ceiling, also made from concrete. In the swimming pool room, meanwhile, metal tiles make are used, surrounding a 75-foot-long pool and shimmering as they reflect the water. They cover the columns and ceiling, for which we already know the hidden material. Outside, beyond floor-to-ceiling fenestration is a terrace that comes complete with a hot tub. Additional leisure amenities can be found in the form a yoga studio, fitness center, and sauna that uses more reflective tiling on columns and timber strips for seating that wraps around corners. 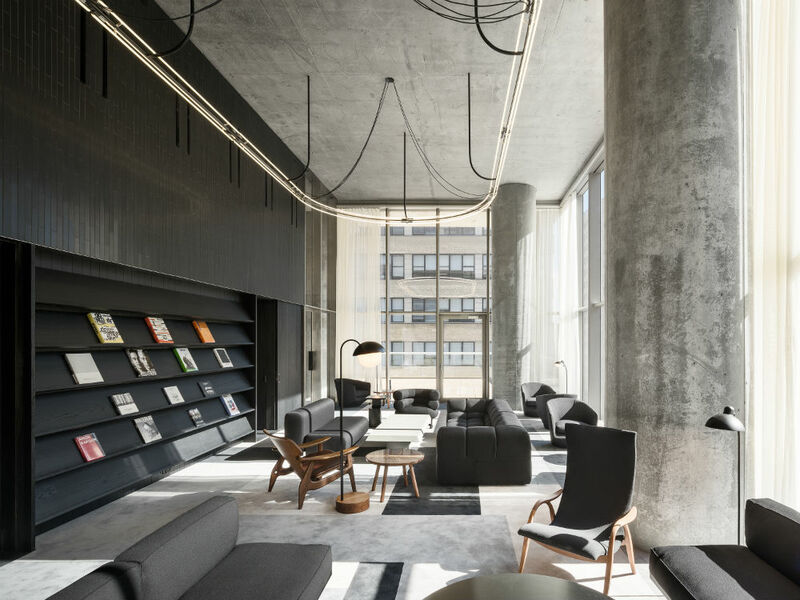 Leather, meanwhile, is the material of choice for seating in a theater donning an all-black aesthetic and using a metal lattice for the ceiling. Light is let in through another floor-to-ceiling curtain wall that spans the double-height space, facilitating views out onto a terrace and over the street. Furthermore, residents have access to a private dining salon, catering kitchen, conference center and a children’s play area. 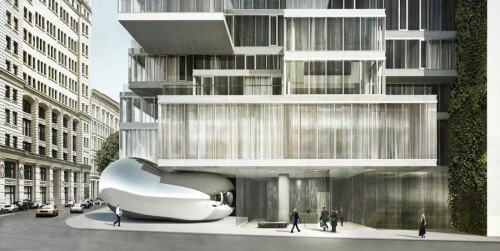 To check out more luxury living that was unveiled this week, take a look at Zaha Hadid's 520 West 28th Street in Chelsea. Long delayed, Herzog & de Meuron's 830-foot-tall stacked tower planned for Tribeca in Manhattan is set to resume construction imminently after a three-year hiatus, reports the Tribeca Tribune. The 57-story residential building at the corner of Leonard and Church streets has been nicknamed the "Jenga Building" for its distinctive massing that varies on each floor. The tower is expected to be complete in the spring of 2016.